Copyright © 2002, P. Lutus. All rights reserved. Okay, first I want to say that, notwithstanding my lifelong good relations (and good luck) with bears, they are wild animals and if you give them a hard time or are simply unlucky, they will eat you. They are dangerous, wild animals. Everything on this page is just my personal opinion, and if you intend to visit bear country, please — get fully briefed by a professional on the risks and accepted practices. I've been seeing a lot of grizzly bears over the past few years. As I said on the kayaking page, I mostly visit bear country by paddling a kayak, which seems to suit the bears just fine. The kayak is quiet, unobtrusive, and I stay a decent distance away from shore most of the time. When I hike in bear country I carry a pepper spray canister designed for use against bears, but many people I've met regard this as a silly defense against a bear. Many Alaskans regard any defense less than a gun as foolhardy. I haven't ever tried to use the pepper spray on a bear, so I just don't know how effective it is. I carry it more as a security blanket than as a device of known effectiveness. Fortunately, I have never had a hostile encounter with a bear, brown or black. Mostly I think this is luck, since I have met so many bears in my life. Maybe part of it is that, like a bear, I am a large, slow-moving creature, and when bears meet me on the trail, they see a kindred spirit. This is just a guess. My most memorable bear encounter took place along the Rogue River in Oregon many years ago. After a long hike I arrived at a very nice riverside site in a wilderness area, and prepared to make camp. The riverside was a flat, grassy area, very bright in the afternoon sun. I knew there was a stream of fresh water behind the tree line, so I grabbed some water containers and headed over toward the trees. Without reflection I stepped across the boundary between the flat grassy area and the line of trees — in other words, from a bright, sunny area to a very shaded, not to say dark, canopy of trees. And while blissfully thinking about almost nothing, I stepped on a bear who was sleeping just inside the tree line. The bear jumped up, grunted and stepped back. I stepped back as well, one pace, sort of in shock. And I remember this — I said "Umm, Sorry!" in a relaxed voice. Then there was a long pause, in which I didn't look directly at the bear, but just looked around, deciding what to do. The bear seemed pretty relaxed, given the situation, so I stepped to the side, entered the canopy and made my way to the stream. The bear followed me — not in an aggressive way, but just sort of curious, keeping a certain distance between us, sniffing in my direction. I decided I would talk to the bear. I figured a normal conversational voice would calm him down if he was not already calm. I explained that I was getting my water, just small talk like that. The bear seemed to be taking this all very well, and it occurred to me that he had some past experience with people. Then I realized this bear already knew me, and that explained why he was not any more startled than he was. I had seen a bear near this same area a few weeks earlier, asleep under a tree. When I walked past he had lifted his head, taken a couple of sniffs, and laid back down again. For a bear, taking a sniff like that is comparable to people having a short conversation and exchanging cell phone numbers. So I and the bear parted on good terms, and I tied my food way up in a tree that night. In recent years I've been visiting a floating resort located on Knight Inlet, B.C., specifically at Glendale Cove, the cove located on the elbow of Knight Inlet. Not to oversimplify, but this resort basically shows bears to its clients. 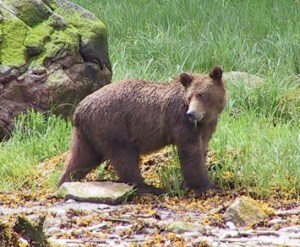 There are plenty of local bears, and they are nearly always doing something interesting — catching salmon, clamming along the beach, eating berries or sedge grass if there's nothing better to eat. I'm not the kind of person who goes to resorts as a client, but I've met the people at the resort while kayaking in Glendale Cove, and some of them are rather well-versed in bear lore. One thing I learned there is you can't determine a bear's species by its fur color. There are brown black bears, and there are black brown bears, if you follow me. The only way to distinguish black bears from grizzlies is by the shape of the skull and the distinctive shoulder hump grizzlies have. And get this — there are even white black bears. They are colloquially called "spirit bears," and they are quite rare. They belong to a subspecies of black bear, and of the subspecies, about one in ten has white fur. I've never seen one. One of the people at the resort has come up with a rule I think makes a lot of sense. The rule is called "Three strikes and you're out." It works this way — if a bear interrupts what he is doing and looks at you three times, he is being disturbed by you and it's time to leave. I like this rule and I've begun to practice it. And, in my own defense, the picture at the top of the page entitled "You lookin' at me?" was the only time this bear looked in my direction. He just happened, quite coincidentally, to look like he wanted to tear me to pieces. By far the most remarkable bear location I visited during my cruise is called "Geographic Harbor," located on the Alaska Peninsula at 58° 6.174' N, 154° 35.425' W, west of Kodiak Island on the shore of Shelikof Strait. A number of Alaskans told me about this place. Many of them had never visited it, but had only heard stories about it. The site is called Geographic Harbor because of its remarkable geography, not the remarkable bears, but unfortunately it was cloudy all the days I was there, so I never got to see the harbor in its full splendor. But I certainly saw bears! This was one place where I decided to explore entirely using the kayak — I didn't dare walk on the land. 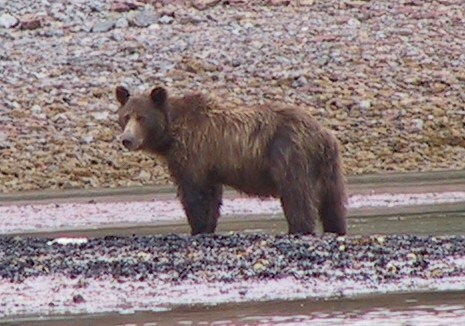 I happened to arrive at a time when there was a very low tide about midday, and I know bears are avid clamdiggers. 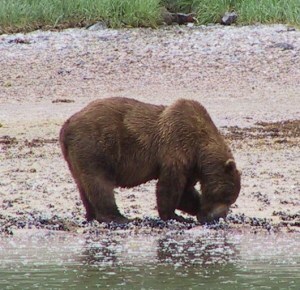 And, sure enough, as the tide fell, many bears appeared along shore. This may be hard to believe, but I saw many more bears and groups of bears than I could paddle over to and photograph in a finite time interval. Also, I sometimes wanted to just look at the bears through binoculars (a better view than the camera provides) and appreciate the experience without trying to take pictures. You may wonder why there are so many bears in this particular place. Well, it is very remote — over 200 miles southwest of Anchorage, the nearest large city, and inaccessible by road, the only practical way to get there is by boat or airplane. Even given these travel methods, it is not on anyone's regularly scheduled itinerary — except the bears, of course. It is formally part of Katmai National Park, but don't let that fool you — the bears are in charge, not the forest rangers.